There are a number of questions about purple martins that are asked over and over by people interested in attracting them. On this page I've placed the answers to a few of them in hopes of helping folks understand this hobby a little better. If you have a question, take a look and see if your answer is here. If not, then by all means, email it to me and I will attempt to answer it for you. If you like, print this page out and put it in a 3 ring binder so you can refer back to it if needed. It should help make keeping martins a little easier, not only for the beginner, but for the experienced landlord alike. Also, the answers on this page are using the latest information gleaned from research that has been done on purple martins in recent years. The answer to your question may differ from other answers that you may have heard, but I strive to stay with the latest technology in this hobby and therefore, my answers might be a little different. Where possible, I will state what the old answer may have been and why the new answer is given. Where can I get house plans? 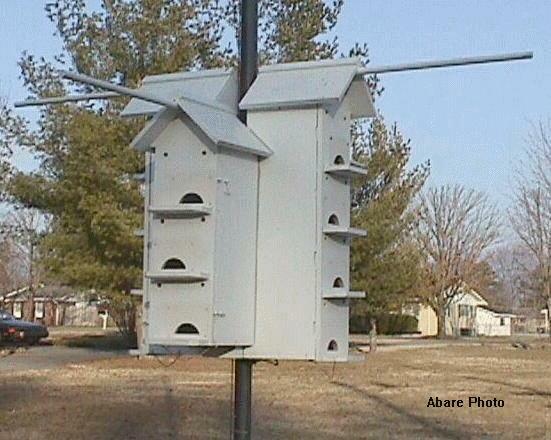 I've been asked a number of times for plans by people interested in building purple martin houses. Depending on the style of housing you're looking for, there are a number of different sources for plans. If the gourds appeal to you and you think you might want to grow some but don't know where to get the seeds, here's a way to get some free ones sent to you. If you get me an envelope as described, I'll fill it with enough seeds to grow a ton of gourds. If you're interested in building them an actual wooden house, then there are a number of different options. If you want to build a T-14 as shown below, then the plans can be obtained from the Purple Martin Conservation Association. They sell the plans. This link takes you to their page and the information to obtain their catalog is found there. 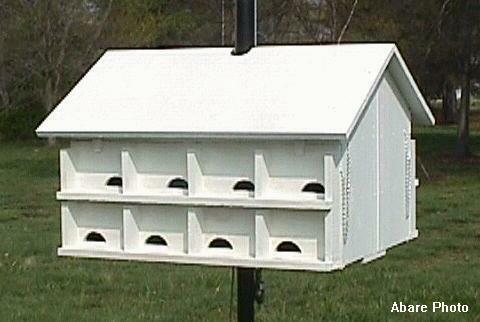 If you wish to build them a house that is a little simpler, then there is an entire heading devoted just for purple martin housing on my Links Page. 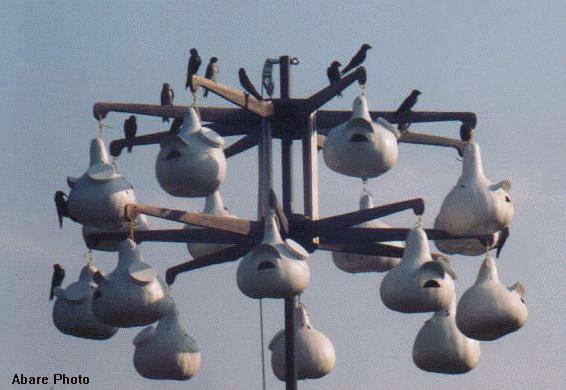 Once there, scroll down to the heading "Purple Martin Housing". However, let me add one thing. If you're intending to build a house for martins, then there are some rules that need to be followed if you plan to do it right. A lot of housing today wasn't designed to take care of the birds and any plans used should be modified so that you can. Read on for more details. The same rules apply for man made housing. If you're interested in purchasing a house, there are a number of different links to commercial house manufacturers from which you should be able to select a house that interests you. Since there are too many to describe here, you'll just have to check out the links there and see what interests you. One, first and foremost, make sure it is a quality built house. Many houses on the market today are terribly designed for keeping purple martins. They are built out of weak materials and will barely withstand a good gust of wind let alone a good blow. Remember, this house has to protect baby birds. Two, the housing should be easily accessible, without tipping, to clean out pests and do nest checks. 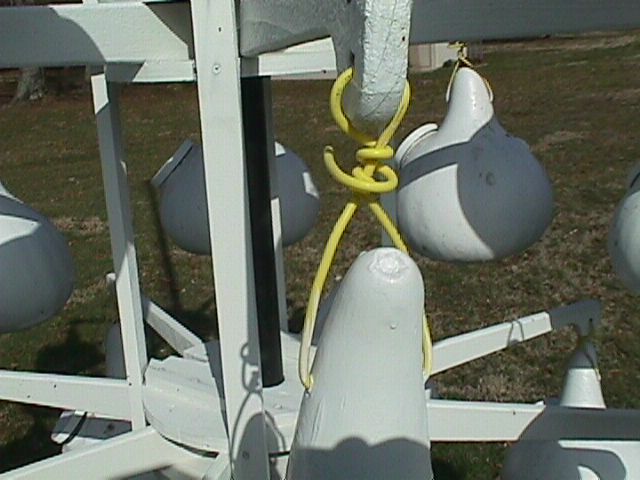 This means vertical raising and lowering of housing with a rope and pulley or cable and winch system of some sort. The inside of the house should be easily accessible via doors or removable front panels. Three, if the house contains 6"x6"x6" compartments, then insure they are expandable by removing a middle panel, or drilling a large hole in it making the compartment 6"x6"x12". It's a proven fact that martins do much better in compartments that are larger. 6"x6"x6" compartments simply are not big enough for martins regardless of what any housing manufacturer says. Remember, they are selling houses for a profit and will tell you what you want to hear to make that sale. If the housing does not have this feature, then please consider another house. Four, make sure the housing is white. White will help attract the martins while at the same time, repel the heat of Summer. Five, 2" diameter round holes are no longer recommended for martin housing. The new crescent designed holes are now much more advantageous in keeping out some predators of martins. If the house has round holes, then it should be retrofitable to the SREH's. If not, then continue looking elsewhere for a house. Too many times an unsuspecting landlord 'wannabe' purchases one of these houses and then for many years, wonders why martins will not come to his house. If a martin does not feel secure in it's nesting location, then it just won't choose that place to nest and will look elsewhere. Spend some time and learn about the martins 'before' you spend the money on housing. Then, make a choice of good quality housing and put it up. Good quality housing might cost you a little more to begin with, but in the long run, you'll be glad you did. I would like to start a Purple Martin colony. Is there anything special I should know? Yes, I'm afraid there is. Keeping purple martins can be a very gratifying and enjoyable hobby, but it's a lot more complicated than just putting a house on top of a pole and letting them come. Sometimes, if certain rules aren't followed, martins may never come and the house is then taken over by either English House Sparrows or European Starlings, the martins worst nesting competitors. Many people today just buy one of those little martin houses that are on sale at all the local retail outlets and then stick it up on a pole and that's about the worst thing one could do. A good many of these houses are very inadequate for keeping purple martins and the intended landlord needs to be aware of a lot of things before spending any money on these things. The first thing you have to do is educate yourself. Read, read and read some more. Find out everything you possibly can about them BEFORE you purchase and put up any housing for them. Read and understand the rules for attracting them and why people lose them. Find and talk to people that have martin housing and ask them questions. Look for different styles of houses and find out what the results were. Are the landlords happy with the results? Has the landlord had any martins settle? Is the quality of the house they have good? Only after you are prepared to take care of them, defend them against nest competitors and understand them should you begin setting up housing for them. So many people today want to get into the hobby, but don't take the time to educate themselves and understand the birds and their habits, that they end up actually hurting the hobby. Other pest birds are pestering them so much that they give up and the pest birds win and the martins lose, so please, if you're going to do it, then please, "do it right". How high should I place my housing? This is a personal preference and may even depend on the type and location of the housing. Assuming that your location meets all the needs and spatial requirements of the martins, then the most favorable height is around 12'. The housing can be placed as high as 18', but remember, the higher it is, the more susceptible it is to winds and also, the less you'll personally be able to enjoy them. I have a few friends that have their housing down as low as 10' and they are full of martins. If you have a telescoping pole, then obviously, you will want to keep it lower. It would become very awkward and tiring to try and stretch a telescoping pole to 18'. Martins do not mind nesting close to the ground as long as they feel safe, hence predator guards are a must. I've even seen them nest in a gourd that was attached to a 4' high page wire fence near a horse pen. Shoot for the 12' range in height and your martins will do just fine as long as you keep any predators away. How big should the entrance hole be for martins? 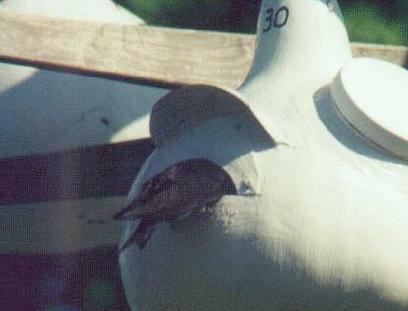 According to most specification sheets available on this subject, the entrance hole for purple martins can be anywhere from 1 3/4" to 2 1/4" in diameter. Most commercial houses are sold with the 2 1/8" holes in them. If you're building your own, then the decision for the entrance hole is yours. Because of the recent increase and infestation of European Starlings, it is now highly recommended that these round holes be changed to crescent shaped Starling Resistant Entrance Holes (SREH). A lot of testing went into a couple of different shapes to create an entrance hole that would keep starlings out of martin housing, one being the oblong, the other, crescent. It was found that in many cases, starlings could negotiate the oblong and that shape was quickly eliminated as a martin entrance hole. However, the crescent shaped hole (shown below) has proven to be very effective as a deterrent for starlings and is quickly becoming the new standard for entrance holes for purple martins. If you purchase a house or directions to build a house with round holes, then they are well behind the times and you should make the change to the new crescent holes. My entire site has been changed to these crescent shaped SREH's and is now starling free. (See the gourd rack above). In fact, many sites in my immediate area have changed to crescents and they are no longer bothered by starlings entering the martin housing. 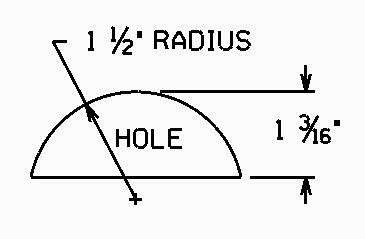 The dimensions for the hole are given below. Using a compass and a sharp utility knife, a pattern can be made from a piece of sturdy plastic and then used to trace the hole to where it is wanted. Please be accurate with the dimensions. They are important. (I made my pattern from a plastic mayo jug). But I'm just starting out. Wouldn't it be better to start with round holes and then switch over to SREH's after the birds are established? No. It was originally thought that a new site should start with the round holes and then change to the crescents after the birds settle in, but that theory is also now old school. It's being proven every day on new sites that martins, looking for nesting sites, will readily accept the crescent shaped holes and the round holes are being eliminated. Martins do not look at the geometry of a hole, they only see a black opening and once they look in, know that there's an empty cavity suitable for nesting behind it. It may take them anywhere from a few minutes to an hour or two to figure them out, but martins are fast learners and quickly learn to accept and negotiate the new style holes. The following links will give full instructions on how to make the new crescent shaped starling resistant holes. For gourds and housing that already have round holes, this link will tell you how to change them to crescents. Changing to Crescents It even shows how to change the new plastic gourds to crescents. One other note. If you start out with Crescent SREH's, it will eliminate any problems you have with starlings right from the get go. In fact, you'll actually enjoy watching the starlings as they are bewildered at these holes they can't get into. Trust me, these really work and your new martins will be sliding in and out of them before you even know it. Since all birds come in different sizes, even an occasional smaller starling may figure out how to get into one of these holes, but that is rare. 98% of all starlings are not able to negotiate these crescent shaped holes when cut to the right size and that's a heck of a lot better than letting the 100% in. In all my time of having crescents at my site, only one starling was small enough to make it in, however, he is no longer with us today. That's why their called 'starling resistant' and not 'starling proof'. I've tried the new crescents on my gourds and they work great, but I've noticed one thing. The birds go in real easy, but seem to struggle when coming back out. Why is this? The reason your birds seem to be struggling to come out of your crescent SREH is because the nest level is too far below the 'bottom' of the entrance hole. Martins do not build a very elaborate nest and sometimes it's quite a bit below the bottom of their entrance hole. This is especially true with deep gourds where the hole is high on the side. An easy fix for this is to add enough nesting material so that the nest level is about 1/2" below the hole bottom. If you do not normally add nesting material to your housing, then this is a good time to start. I always add fresh nesting material to all my housing each spring and the birds seem to really appreciate it. I keep some extra on hand just to build the nests up a little just in case they pack down too much. Their constant walking on them will soon pack the nesting material and this is another good reason for using material that drains well. I also keep a raised platform with more material on it just in case they want to add any final touches to their nests. (See below). Which is better for martins, gourds or houses? This is a question that has been debated for years by purple martin lovers and it still isn't answered today, so let me just say this. I have three different kinds of houses at my site, wooden houses, plastic and natural gourds and I can honestly say this. The martins seem to prefer the large, white natural gourds first and then they select the other two types of houses second. But this is in my area, martins in your area may prefer something different. And as for aluminum houses that seem to have problems attracting martins, I do know that hanging 4 large natural gourds under them will help attract them faster. The martins usually end up filling the gourds before they will move into the house. And one more thing, if you've purchased or have an aluminum house that only has the small 6" x 6" compartments, then they need to have the center wall removed and one of the two holes plugged thus doubling the size of the compartments. Tests have proven that this will also help attract your martins much faster. The new deeper compartments allow for the martins to back out of the reach of most predators that come visiting. Also, one more thing. When you enlarge your compartments, make sure you make the change to crescent entrance holes. Starlings also love those enlarged compartments and will move right in on you if given the slightest chance. If you want to see a lot more information on the subject, read all the information on this and my �gourd� pages. And another issue is a factor of 'area imprinting' to be considered. Martins in the northern latitudes are much more used to wooden houses while many martins in the southern latitudes are used to gourds. I simply say that if the martins in my area choose the gourds over any other housing offered, then why not supply them large, natural, thick walled gourds to nest in, period. They've already made 'their' choice. Still another issue to bring into this debate is the arrival of the new plastic gourds and houses. Again, this is personal preference and you will have to decide which you want to use. The best thing to do is supply a variation of housing and see what the martins in your area prefer. I want to use gourds, but don't know how to hang them. Here ya go. This shows how I hang mine. Let me add one thing. Make sure when you complete the hanging that the gourd 'swings, without twisting'. Although the swinging won't prevent the starlings from nesting in them, sometimes it helps. Starlings also love to nest in large gourds and this applies especially to the ones that are hung horizontally and tied down where they are stable. As far as all tests show, the starlings will take these horizontal gourds first and once established, will not vacate them. Although this method may look aesthetically pleasing, it makes for a starling haven. Also, if there is a starling problem, then SREH's should be added to your gourds. I bought my house. Now, where should I put it to have the best chance of getting martins? -Martins like wide open spaces, so with that in mind, the house should be placed in a very open area, but within site of your own home..
-Martins hate tall trees. The house should be no closer than 40" feet of any tall trees, further if possible. -Martins like water, (not bird baths), so if you have clean, open water available (a pond or river) within a mile or two, then that will be advantageous in attracting them. -Martins like power lines. If you have some readily available, they will use these to perch and preen on. -Martins like to see people, so the house should be located near your own house. 30' is not uncommon with the average being under 100'. -Martins like activity. No, it won't hurt to have the kids running around or you out in the garden. Near a driveway or back deck is also good. I've read where some folks say that PVC pipe could be used to make less expensive martin poles. Is this a good product to use for a pole for my housing? As far as I'm concerned, NO. PVC, (Poly Vinyl Chloride) pipe is no where near strong enough to use for martin housing. Here's a couple of reasons why. One, PVC becomes very brittle in sunlight. Most PVC pipe does not have UV (Ultra Violate) inhibitors and will quickly become extremely brittle. Once this happens, even just a sudden change in temperature could make it fail and the next thing you know, your housing will be on the ground. Although seemingly strong when new, this quickly changes when the sun starts shining on it for any length of time. Two, PVC pipe has a very low Modules of Elasticity (one of the numbers used in the calculation of material strength) and thus, has no structural strength. Because of this, a sudden wind could quickly snap the pipe. Three, a long piece of PVC pipe is very flexible and the house would become very unstable, especially in any kind of storm. A sudden strong gust at the wrong time will put your martin housing on the ground, along with everything in it. I am a Mechanical Design Engineer by trade and believe me, the best thing to use for a martin pole is a good schedule 40, (or 80) round steel pipe. (NO, square and triangular pipes are not stronger than round pipes of the same size). Some come with a galvanized coating and may be used just like that or may be painted to your favorite color. It might cost a few dollars extra to get a good pole, but the piece of mind that comes with it is worth every penny. I've read where I should wait 4 weeks after I see the first scouts to put my housing up. Why is that? It was originally thought that the only way a new colony would get established was with the returning SY birds. Supposedly they were the ones that colonized new sites. Plus, it was thought that if you put your housing up too early, the pest birds would inhabit it long before the martins got back. But that way of thinking has now changed. It's now 'suggested' that you put your housing up when the scouts arrive because some of the older birds just might find your site more attractive than their old one and move. Martins have a very strong site fidelity for their home sites, but if for whatever reason it becomes run down and infested with pest birds, it is now recognized that they will move to another site. Therefore, don't wait. Put your housing up when you see the scouts. And make sure you use SREH's and sparrow control. I've noticed that all your gourds and housing are painted white. Is there a reason for this? Yes, and in fact, there's actually a number of reasons for this. One, martins nest in the summer and that's the hottest time of the year. White is the most reflective color we have and thus, reflects the heat of the sun. We all know that the darker the color, the more heat is absorbed, so with that in mind, try to imagine a baby bird in a dark colored bird house with all that heat and being unable to escape it. For that reason alone, all martin housing should be painted white. Two, white stands out. Incoming martins can see it from a long distance away and it really helps to draw them in. Then, once they arrive, the dark entrance hole really contrasts the white gourd or house and they can zero in on it when making their landings. Three, white just plain looks good. Kind of like sparkling clean so to speak. When you see something white, it reminds you of 'new and shiny'. I've heard that the light interiors helps keep starlings out. Should I paint the insides of my house white, also? No, that's not necessary. All birds like to have the interior of their nesting cavities dark. That thing you heard about the light interiors keeping starlings out is another one of those statements from the manufacturers of aluminum housing to try and sell their products. The reason starlings don't like to nest in their houses is the fact that the compartments are too small. Starlings are no different than any other bird, they like large, roomy compartments too. But if that's all that is available and they want to nest in that house, then they will, bright interiors and all. When I went to buy an aluminum house, the saleslady said that aluminum helps keep the nests free from mites. Is this true? Absolutely not! She is only trying to make a sale. First, the lady at the bird house store needs to be educated about the birds she's selling housing for. (Or at least be truthful). Mites will infest any type of bird housing REGARDLESS of the type and that includes the aluminum houses she is trying to sell you. Mites are found in the nesting material and since all martin housing has nesting material, then you can have mites. Second, there are a number of different myths being passed around about martins and their types of housing, and unfortunately, a lot of them are not true and this is one of them.. You'll also hear that the bright interiors of aluminum houses helps keep out starlings. That also is false. The only thing that helps keep out the starlings is the 'small' compartments in some of the commercial houses, which by the way, also works to keep martins out of the housing as well. Many a potential landlord has emailed me wanting to know why martins will not nest in their aluminum housing like the advertising stated and all I can do is be truthful and tell them that, most of the time, it's the small compartments in their houses. As I've stated before, this is the way myths get started. Someone that has no idea of what they are talking about, says something off the wall and of course, it spreads throughout the martin world. This is why I say, talk to the experts, not your neighbor and definitely, not a sales person. Is there a perfect martin house? The 'perfect' martin house would be very difficult (and expensive) to design and build but I will say this, we are getting there. Some of the houses built by newer and more educated manufacturers today are much better than others. With today's increased knowledge of martins and keeping them, there have been a number of very good improvements in the housing industry by 'new manufacturers' that have the martin's best interest in their products. However, there are still some that refuse to improve their houses and some of these that are offered for sale are absolute death traps for martins and in my opinion, should not be allowed to be put on the market for sale. I just wish there was a 'code of conduct' required for martin house manufacturers to follow, but there isn't. Their 'main goal' is still the 'bottom line'. I won't mention any names, either good or bad, but as I've stated before, please educate yourself first. Then, look for quality. Some houses just aren't fit for purple martins and in fact, even the starlings won't nest in some of them. You might have to pay a little more up front for a quality house, but many years down the road, that quality house will still be doing it's job where as the cheap ones will just be adding to the sparrow and starling slums or the junk piles. So, what should I look for in a 'quality' martin house? Although I say this throughout my pages, here's a condensed summary of what to look for in a good quality martin house. -First, look at the over all design and structure of the house. Is it sturdy? Is it made from strong materials that will last for years out in the elements? Cheap houses are much more costly than good quality houses in the long run. -Does it have the new recommended 'deep' compartments? Compartments that are at least 9" or 10" deep to allow the martins to back out of the way of any entrance hole dangers. -Does the house either come equipped or have the capability of changing the holes to the recommended Starling Resistant Entrance Holes? If it only has the capability of round holes, the look for another house. -Does the house raise and lower vertically on a pole? Houses that tip or worse yet, are hard mounted are not good designs and you should stay away from them. These type of houses are bad in the fact that they are not easily accessed and the other competitor bird species will soon take over your new house and there goes your chances to get martins. -Does it open easily for nest checks and maintenance? Houses that do not open easily should not be used for martins. Houses that do not have these features should be left right on the shelves. Somehow, the retailers have to get the point that these houses are not any good for martins and if we hit them where it hurts... (in their pocketbooks), then just maybe they'll get the message. Yes, a quality house will cost more initially, but in the long run, it will cost you a lot less that replacing junk housing every couple of years. When should I put my housing up? When should I open my housing? Both of these questions go hand in hand and again, the answer to these questions have changed. It was once thought that if you don't already have an established site, that you should wait 4 weeks after the arrival of the first scouts and then open your housing. But, that thought is now different. First, look at the map on The Bio Page . Find the area on the migration map where you live and the approximate time the scouts (first birds to return) come through your area and have your house up and open. Many times you'll pick up some birds that were misplaced from other sites. If nothing shows, it won't be long before the SY (Second Year) birds will be coming through your area and they are the ones that usually settle new sites, but not always. According to all reports, the scouts are already through my area. Is it too late for me to get martins this year? No, as a continuation to the answer above, just because the scouts are through your area doesn't mean you've missed your chance to get a colony. In fact, you still have some more waiting to do. All new colonies have to start somewhere, however, although it does happen occasionally, it's usually not done with 'Scouts' or mature birds. Scouts are nothing more than the first mature birds to return north during migration. These mature birds usually return to the site they successfully nested in the previous year. Often times, they will even spend a night or two in your house and rest, but then will usually move on to their home site. What normally happens is SY (second year) birds usually begin arriving about 3 or 4 weeks behind the scouts. Usually, these are the birds that will begin to colonize your site. 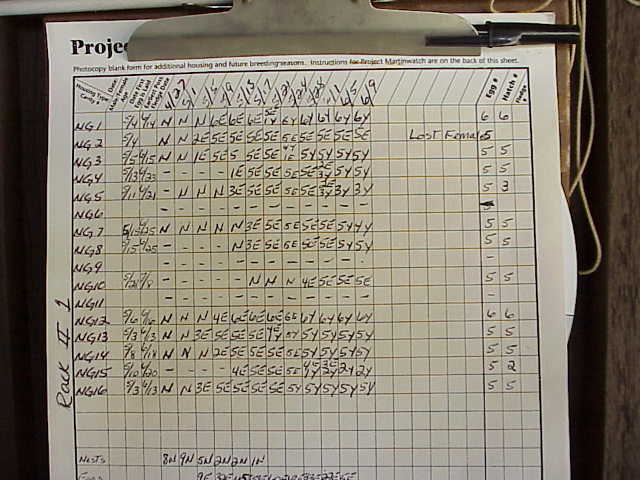 Then, for the next 4 or 5 weeks, more SY birds will continue to migrate north and hopefully, they will find your site. If you get word the scouts are thru your area then relax, you still have another 4 to 8 weeks to attract martins. We've had our housing up for years and have never gotten martins to nest even thought we seem to have the perfect place for them. They come and visit and will even hang around for awhile, but always leave without staying. What's wrong? There could be any number of reasons, but if I had to guess, I'd have to say it's probably the housing. First, does your housing have small compartments? That could be one of the major reasons. Although the housing manufacturers say that the 6" x 6" x 6" compartments are recommended, they are wrong. (6 x 6 x 6 compartments are cheaper to manufacture). Martins need more room. This is one of the major problems in the martin house industry and many are still refusing to change. There could be other reasons, but first, enlarge your house compartments, then be sure and add the crescents, and then sit back and watch what happens the next time a martin visits. Our house is new and the very first bird to visit is an all black male. Does that mean that he came from another site? To be honest, there's no telling where he came from, but here are a few possible answers. -He could be from another site that was either lost or over run with pest birds. -There's even a good possibility that he and his last year mate tried to nest in that old site but were unsuccessful and he decided to find a new one. -He could be a SY male from last year that was unsuccessful in attracting a mate and decided to look elsewhere and your site just happened to be it. -He could be a migrating male that simply decided to not return to his original site and decided that yours looked better to him and he wants to stay. Which direction should I face the holes in my house? I personally don�t see any difference as far as the compass direction. However, I do see a difference when it comes to accessible flyways. My racks offer 360 degree accessibility and almost always, the gourds chosen first are the ones that are most easily accessible. Face your house to the open flight paths and you should do just fine. One other thing to note. I have noticed that with my own colony, the birds will often pick the larger gourds that are facing my own house. I can't prove anything with this, but just maybe they want to see their landlord and know that he or she is around. It might have something to do with the protection thing, and it also makes for much better viewing on my part. I have a night security light on my property. Will this bother them? No, not at all. In fact, I also have one and it's less than 5 paces from my nearest rack and house. I don't see any difference in their nesting habits at all. In fact, the main power and T V cable lines to my house use that nightlight pole and so do they for perching. I have a number of pictures with them sitting right on top of the light. Martins are not the least bit afraid of man's modern technologies. They only know that some of it keeps predators away and that makes them feel a lot more secure. I decided to go with plastic gourds, but they're very white on the insides. Should I paint the insides with dark paint? No, that is not required. Martins will use them just the way they are. In fact, since the introduction of the 'larger' plastic gourds by the 'responsible' manufacturers, the martins have loved them. With these new gourds and their easy accessibility, it's a very good way to keep martins. And besides, these new gourds are made with polyethylene with UV inhibitors, and they're so slippery that your paint would fall off within a short time anyway and now you'd have paint chips in your nests. However, one thing I would add is a good thick bedding of pine straw or wheat straw. The insides of these gourds are so slippery that the martins will not be able to get a good foot hold, so a thick layer of one of the above will make them feel a lot more at home. I add enough to bring the level up to the bottom of the entrance hole. They will work them to what they want and it will save them time in nest building in the long run. What in the world is meant by HY, SY and ASY? These are nothing more than acronyms or, shortened terms, for a quick way of expressing the age of the birds you're dealing with and is determined by the plumage. Hatching Year, (birds born this year), Second Year, (birds born last year and still having adolescent plumage), and After Second Year, (birds born at least two years ago and have now attained their adult plumage). Other terms you'll see a lot is SREH. (Starling Resistant Entrance Hole). This has to do with a new type of entrance holes used to help keep starlings out of housing. Another is S&S (Starlings & Sparrows). A short way to describe two of the martins worst enemies. Birds spent the night in my house. Will they stay? Birds keep coming to visit, but then disappear. Why won't they stay? These questions are asked by a lot of people that have put up new housing and want to become purple martin landlords, but to be honest, I can�t answer them. We are dealing with wild creatures and I have no clue whether they will stay or not. They might just be passing through, or they may actually be looking for a place to set up housekeeping. If the former is the case, then they will be moving on to the site where they nested last year. If the latter is the case, then they've found your site to be interesting enough to investigate. This is why, as potential landlords, we should do all we can to insure that our houses are as good and safe as can be. If the birds think the same thing, then there is a good chance that they will stay. I've read that martins like eggshells. Will this help attract them? No, not really. Yes, it's true that martins like eggshells, but this is usually only during nesting and brooding periods. The females use them for grit and a source of calcium which they need to make their own eggshells stronger. They also feed the to the young for the grit and calcium. Putting eggshells out before martins arrive will only attract all the other birds in your yard. However, that's not all that bad either. If they are friendly birds, then they too will need and use them for the very same reasons. My visiting barn swallows love them just as much as the martins. If you have an established colony and want to offer eggshells, then simply make a small platform feeder and fill it with crushed eggshells. They are easy to prepare and your birds will love them. Wash your eggshells with plain water to remove the inner membrane. Then, stick them in a preheated oven for about 2 or 3 minutes. They can also be placed in a Microwave for a few minutes. Then, after they cool, crush them and put them in the feeder. That's all there is to it. We don't eat that many eggs at our home. Is there another way to get some? There sure is. One way is to have some of your friends keep eggs shells for you following the cleaning and cooking procedures described above. You pick them up every now and then and add them to your stash. Now, you got a mess, right! Well, yes and no. First fill the bag with 'plain' water to just cover the eggshells. Then slosh the eggshells around with your hand or a sturdy stick for a few minutes. (If you use your hand, you might want to use a thick rubber glove for protection from sharp edges). This will remove the membranes from the shells. Don't worry about breaking the eggshells because you're going to end up doing that anyways. When done, slowly pour out the water and the floating membrane. Now, you'll need a pillow case that zips closed or that you can securely tie closed. Pour the eggshells into the pillow case and zip it shut. The excess water will simply drain through the pillow case. Hang it somewhere and let it drain until the dripping stops. Now, simply toss it into the family dryer and let it run on hot for about 15 or 20 minutes or until they are dry. Viola, you now have a large amount of eggshells for your eggshell feeder an they're already crushed from the rolling around in the dryer. It's as simple as that. What about perches? If I add them to my gourds, will it help me attract martins? No. Do not add any kind of perches to any of your gourds. This will only help the pest birds and predators get a foot hold on taking over that gourd. Perches under entrance holes are the results of humans thinking they are doing the birds a good turn when in reality, they are actually harming their tenants. Pest birds such as Sparrows and Starlings use these perches to trap the legal inhabitants within the gourds and then attack them. Think of what they dealt with before man came along. Old woodpecker holes in hollowed out trees. There were no perches or porches of any kind on them then and they don't need them now. However, they do need roosting arms and these are usually placed away from the entrance holes. These can be long rods in starburst patterns and placed over the housing so that the birds have something to land on when they fly into the site. From that point, they will fly down and light in the entrance hole clinging to the front of the gourd with ease. Martins have very strong tail feathers and can pry themselves into their entrance holes very easily. What are predator guards? Should I use them? Martins are communal nesters and of course, when you get a large group of any kind of birds or animals together, then there are predators that take notice. There are a number of different flying and ground based predators that martins need to be protected from. Snakes, raccoons, cats, squirrels to name a few. Owls are also a major night time predator that can wipe out a colony in short order. The proper guards need to be in place to keep them from gaining access to your martin housing. And, should you use them, absolutely! It only takes one attack from a predator to make a hard earned colony vacate a site and in some cases, never to return. We have some birds staying in our house, but we're not sure they are martins. How can we tell for sure? 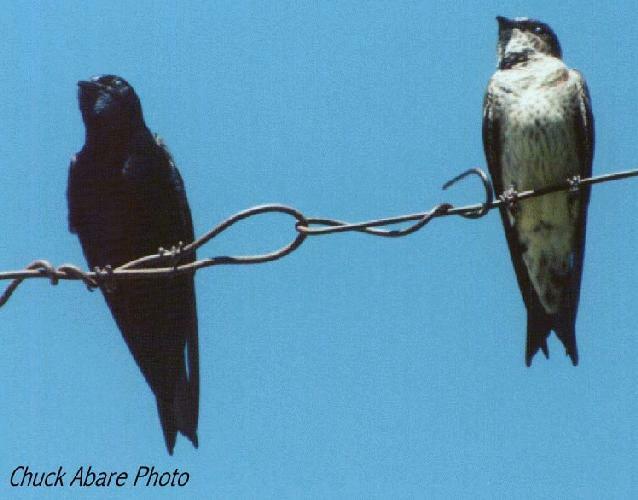 The two birds below are a mature pair of Purple Martins, male on the left and female on the right. If the birds in your house don't look like them, then you don't have martins. The first thing you have to do is determine what the birds are. Next, if they are friendly birds, then they should be persuaded to move on. Usually removing the nesting material a few times will do it. If not, then close up the house for a day or two until they move. If they are another cavity nesting species such as Bluebirds or Tree Swallows, find out what type of housing they require and then put it out for them. The only reason they're in your martin house is because they can't find housing of their own liking and requirements. Supply it, locate it properly and they'll more than likely move right in. However, if they turn out to be either European Starlings or English House Sparrows, then I strongly suggest you eliminate them, period. Trapping, shooting, whatever it takes. These two species of birds are mortal enemies of martins and will prevent any martins from nesting in your house if they're given the chance. We have martins that come by during the day, but then disappear at night. Why won't they stay? There could be a number of reasons for this. They could be birds visiting from another site and are enjoying your site a little more than their home site and just might be looking yours over, but site fidelity is making them return to their home site for the night. If they continue to spend days at your site and like it more, then they may just make the switch and stay. Also, if it's early in the year, they may not be ready to settle down just yet. Remember, these are wild birds and are used to sleeping in trees or on power lines and radio antennas and aren't ready to settle in just yet. They just need some time. We had some martins come by and stay a couple of days, but now they're gone. Where did they go? To be honest, I don't know, but here are a couple of possible answers. One, they could very well be just passing through and found your site to rest for a few days. This often happens with older birds since they are headed back to the site where they nested last year. The will often take a day or two during their migration and stay at any available house that's along the way to rest a little. Two, it could be very early in the season and they just aren't ready to settle in a house yet. Remember, they are still wild birds and usually the only time they stay in housing is when nesting is taking place. Three, if these are young SY birds, then there could be any number of reasons. They are the hardest to predict. Younger birds just don't seem to be in a hurry to nest and even when they do, their hearts aren't fully in it. However, once a nest is completed and eggs are laid, then they will start putting more effort to the task at hand and most of the time, they will succeed in fledging young. We have martins staying at our new house but they aren't nesting yet. What's wrong? Nothing. One thing that new martin enthusiasts run into is 'impatience'. Remember, these birds are just returning to their northern home and it's been a long flight for them. They're in no hurry to start nest building upon arrival. Give them some time. They need to rest a little, get to know the neighborhood and to also get to know each other. We as humans want them to stay and nest, but we want it to all happen NOW and that just isn't going to happen. There are things we just don't understand about wild creatures and when they, the weather and the time are right, they'll begin nesting. In the meantime, just relax and enjoy their antics. Watch them and learn as much as you can about them. Little by little, you'll begin to understand and also become a little less impatient, and before you know it, they and their young will be gone. We finally have some martins that are staying in our housing, but they disappear during the afternoon and then come back in just before dark. Where do they go? They went to eat. Remember, martins eat flying insects and have to go in search of them. (No, they do not eat seeds from bird feeders nor do they drink from bird baths). They will often eat a little early in the morning and then hang around the site for the rest of the morning chattering and socializing and then they are off into the air to eat around noon or early afternoon. Sometimes, they may travel many miles in search of food and of course, that takes them well away from their home site. Martins love to fly and they may go as far as 5 or 10 miles in search of their prey, but not to worry, they will always find their way back to your site before dark. I've read where it helps to put nesting material out for the birds. Does this really help? Absolutely. I do and a lot of other landlords I know also do it. There are a number of different materials that can be used. Two that I highly recommend are Pine Straw (dried pine needles) and Wheat Straw. Both are usually available just about anywhere at garden shops and Co-ops. Others are available, but make sure that whatever you use doesn't get wet and stay wet. The parent birds won't stay in a nest that stays wet. The two I mentioned will quickly drain off any moisture should they get wet. I'm not a fan of the different varieties of sawdust and chips. These hold water much too easily and drain very slowly once wet. And no, the cedar chips do nothing to ward off small insect pests, regardless of what you've been told about smells and odors. In fact, in many instances, the parent birds will toss these cedar chips out of the nest and then replace it with their own materials. The sawdust and chip varieties of nesting materials are very unstable in some housing, mainly the metal and new plastic gourds, and the birds just feel un-secure with them under foot and they will often discard them in favor of more secure footing such as pine straw or wheat straw or what ever other material is available to them. I use both the pine straw and wheat straw. Both are very abundant in my area simply for the raking and bagging. However, both can also be obtained at just about any garden shop in bales. You many not need that much for the martins, but the remainder makes great mulch for plants.. I start the year out with pine straw by putting a good base of it in all my cavities before the birds return. What I do is place enough material in the compartments to 'come up to the bottom' of the entrance hole. Martins are short legged birds and are not able to jump very well, so I make it easier on them by placing enough material so that they can simply step up on the edge of their hole. Then, when they return each spring, they have something to rest and sit on for those first few cool nights. Their walking on it will usually settle it down a little and they'll often add more if needed. Then, around the beginning of nest building time, I place a raised platform near their racks. I then cut wheat straw into about 3" long pieces using a set of pruning shears and mound it up pretty good on the platform. My martins know what this is and readily grab it up and use it to 'finish off ' their nests to their likings. Martins are quick learners and it doesn't take them long to learn that this is theirs to use and it takes them no time at all to use it all up. As your colony grows, you'll find yourself refilling the platform quite often. The picture below isn't very good quality, but it'll at least give you the idea. Don't have a platform... then spread it out on the ground. They'll find it... However, make sure it's safe for them to land on the ground. Martins are very vulnerable to predators when on the ground. As a side note, I've actually had female martins land on the platform and take material while I was filling it. (Pretty brassy if you ask me). We did a nest check and found nesting material in some compartments, but no eggs. Is this normal? Although not always, when you find a nest that doesn't contain any eggs, it is probably the work of a lone male. Many times single males (called floaters) are known to build a partial nest in the hopes of attracting a female. If they end up not pairing up, then the result is an 'almost complete' nest, but no eggs. Pay attention to the nest. If you see only one bird hanging out there, then more than likely the empty nest is the work of a floater. Secondly, sometimes a male will build more than one nest in hopes of attracting a second female. Martins are not monogamous and will attempt to attract as many females as they can. Usually, it's only one, but sometimes, there are multiples. If he doesn't get a second female, then the result is an incomplete nest. We found a nest in our house but we're not sure if it's a martin nest or not. How can we tell? The picture below is of a martin nest with 5 eggs in it. 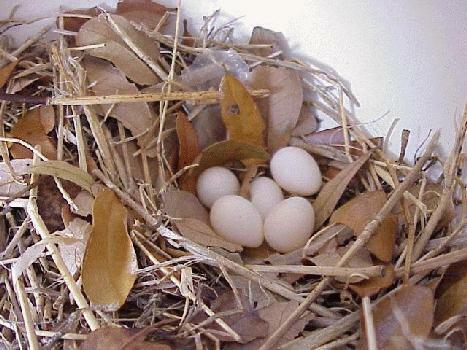 Martin nests are very low profile, often consisting of sticks and twigs and many leaves. In some of the smaller compartments, the nests may even contain a mud damn in the front of it. Although not always, many of the leaves are green when they are placed in the nest, but turn brown after some time. They will constantly replace these green leaves throughout the nesting period. When pine needles, (pine straw), are available, they will often make the entire nest out of them. In this case, the nest will be very flat and compact. A shallow bowl will be at the back of the nest such as shown below. Often, the eggs will be buried under the leaves. Our site is new and all we have are females with the white bellies at our house. How do we attract any males that are all black? Actually, what you probably have are both females and SY males. Both SY males in their second year and females look very similar in coloration and are sometimes very difficult to tell apart, even for the veteran landlord. Pictures located on my, Martin Bio Page show the difference in the colorations of the different aged birds. Next year, those SY males will return as ASY males and will be all black, then you'll have your all black males at your site. Below is a picture of a female, (on left) and an immature male, (on right). Notice the difference in the breasts. The male has the spots of adolescence on his. Also, the male will have a much darker 'cap' and his throat will also be much darker with the beginnings of dark feathers. We have a pair that has 4 eggs in their nest. How long will it take before the babies can fly? It normally takes 16 days from the time the next to the last egg is laid till they hatch. That's when the female starts sitting on the eggs full time. Then, approx 28 days after the eggs hatch, the young should take flight or 'fledge'. That can fluctuate a day or two depending on conditions in and around the site. This is another reason that nest checks should be done on martins. You can keep accurate tabs on your colony and it's well being. My birds are diving at me when I go around them. Why are they doing this? This 'diving' or 'buzzing' is also called "strafing". The word is taken from a World War II action when the planes would dive at the ground spraying opposing ground troops with bullets trying to prevent them from advancing. Your birds are doing approximately the same thing. They are unsure of you and seeing you as a potential predator and are diving at you while squawking at the same time. This is very common in a colony, especially with new birds that have not gotten to know you yet. This will also happen more as fledging time approaches. There really isn't anything to worry about. Some of mine do it about the time of fledging, but I have 'never' been struck by any martin. Usually it's only a bluff, and a condition that still remains in their instincts from when they were purely wild. One thing you can do is spend a little more time under the housing. Do some morning walk-unders or just slowly walk under the housing and stand there and watch them, and although this may sound silly, actually talk to them. They will quickly get used to you and the sound of your voice and the strafing will back off considerably, if not entirely. One thing I do is ignore them. They soon start ignoring me back. The whole thing depends on how much time you spend with them. If you're out and amongst them a lot, they soon begin to see you as part of the site and will go about their daily activities as if you weren't even there. In fact, your birds will become comfortable enough with having you around that they won't even get off the nest when you do your nest checks. I actually have to move some of my females so I can count my eggs. I've read on your page where you state that I should do nest checks. Why? In recent years, it has been proven that nest checks have become a very important part of keeping martins and are a very good way of keeping track of the health of your colony. The old ways of keeping purple martins are slowly but surely dying and educated landlords are slowly replacing these old time landlords. There are a lot of folks that are beginning to do talks and teach people that want to learn, the correct way to keep martins. Recently, many tests and studies have been done on martins and it's been proven time and again that regular site maintenance and nest checks considerably enhances the overall health and well being of your colony. From nest checks, you can tell when nest building starts and how the progress is going, keep track of the number of eggs laid and the number of young that hatched from those eggs. 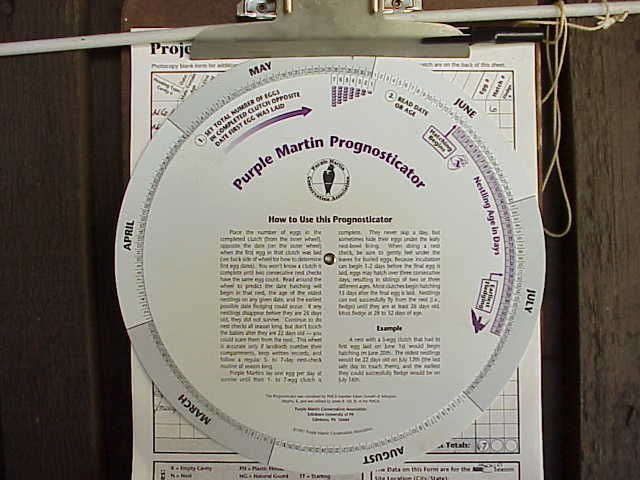 And while you're at it, get yourself a Purple Martin Prognosticator from the PMCA... It's easy to use and it'll take a lot of guess work out of the dating of your colony. The old ways of keeping purple martins are subsiding and as landlords become more and more educated, they realize that they have to keep their hands into their colony in order to tell what is going on. The old adage of 'just put a house up and they will come' no longer holds true. Too many pests, predators and problems can take hold of a colony and quickly rid it of martins. ...but won't I scare my birds away by disturbing them? No, not at all. Yes, the birds may fly away momentarily, but they never go far. Then, as soon as you complete your checks and put the housing back up, they'll return to their duties as if nothing had ever happened. In fact, if you take notice, while you're doing the checks, the birds will either be flying right over head or may land on a nearby perching place and watch what you're doing until you get the housing back up. Many landlords have never done a nest check simply because they are either afraid of scaring the birds away or because they feel the birds can take care of themselves. This thinking is wrong and all landlords need to realize that the only way to tell the health of your colony is to do nest checks. Don't be afraid to check your birds at least once a week, it will help both you and the birds. (I check mine every 4 days). They'll get to know you up close and personal and you'll get to know your birds as well. You'll find out very quickly that purple martins aren't just your normal bird species. They actually need humans to interact with and, in time, will get to know you and will soon start accepting you as part of the everyday happenings around their homes. In fact, I have a lot of females that won't even get off their nests when I lower the racks. I actually have to push them aside to count the eggs. One note here. As shown above, keep good records. When you have young that are within a week of fledging, (flying from the nest), then nest checks should be stopped. Even though the parent birds are use to you, a sudden jerk of the housing could scare the young into jumping prematurely, so if they are 21 or 22 days old, then you should stop the nest checks. But continue to monitor your site from a distance. This means doing daily walk-unders and watching things from the ground. If you have good records, you will know and be able to watch which young will fledge first. They in turn will get use to you and it's kind of fun to watch them peak out of their hole to watch you and it's really fun to anticipate and then watch those first precarious flights. ...but what about the smell from my hands when I do nest checks. Won't the parents smell where I touched? No. Birds in general have very poor smell and in fact, it's terrible. (Other than birds like carrion eaters such as Vultures and Condors). I've seen where I've painted a house, raised it up to dry, and birds were landing on the wet paint and it wasn't bothering them at all. Regardless of what you've heard about adding any kinds of smells such as vanilla or onions to help attract martins, forget it. You're wasting your time and good vanilla and onions. And as for the birds smelling any kind of predator and then leaving, that's also false. The birds left because of the predator, not because of its' smell. We have a dog that is penned in our back yard. Will he bother the martins? Normally, martins will pay no attention to dogs around their site, even if they are noisy. In fact, they soon find them as a deterrent to predators and accept them as part of their site. However; if your dog jumps at the pole, hitting and bumping it in an attempt to try and get at them, then the martins will definitely have a problem with that. If necessary to prevent this, make a small page wire fence that keeps the dog away from the pole. A little gate will allow you to get in and out easily while keeping the problem dog at bay. What about cutting my grass. Won't this scare them away? No, not at all. Yes, they'll initially fly away, but soon return to your house. After enough times of your mowing under them, they'll realize you aren't any threat and will actually begin to just sit there and watch you. It's kind of funny to watch them when they sit on the house to first watch you coming and then pivot to watch you going. And then, before too long, you'll be totally ignored, just like I am. No matter. The noise doesn't bother them. Martins are not a bit afraid of man's modern tools. However, bumping or banging on the pole does, so try and be careful with that part of it. When I did my nest checks, I found the martins had built mud dams in the front of their nests. What's the reason for these? There are a number of different theories on this but to be honest, I don't know for sure. Some say they're to keep the weather out and are found on westward facing gourds or compartments more so than on eastward facing ones.. Others say it's to form a uniform bowl in the back of the nest for the eggs to set in. However, I have my own thoughts on the subject, and I can't prove any of this, but here they are. I feel they are there for a couple of different reasons. If you notice, mud dams are found in the smaller sized house compartments and gourds more so than in the larger ones.. I use nothing but large 10" gourds and 9" minimum deep house compartments and have very few (if any) mud damns in my gourds, even the westward facing ones. Although not always, when you do find them, notice that they are so close to the entrance hole that they actually cut down on the size of the hole. I feel this is their way of making it more difficult for pests and predators to enter the compartment or gourd. Sort of making their very own crescent shaped entrance hole... If a predator can't see into the nest, then they can't see what they are trying to catch. If the access hole size is reduced, then some pests will have a problem getting into the nest. Yes, they would help keep the weather out and yes, they would help keep the young in, but my own personal observations make me feel there are more reasons than just that. When I did a nest check, I found a whole bunch of little black bugs crawling all over the nest and the baby birds. What are these? These are chicken mites and, if left unattended, quite often become a major problem in martin colonies. Mites should be taken care of promptly or they could result in early fledging of the young or worse, their death. These mites feed on the blood of the young and is not a pleasant thing for a baby bird that has nowhere to go to get away from them. Chicken mites are one reason you see so many baby Robins on the ground before they can fly properly. The control of mites and the methods used in their control is a very controversial subject and you'll get many different answers, but here are two methods that do work to keep them under control. This is done by removing the young and placing them in a softly lined bucket or shoe box. Then, totally remove the nesting material from the compartment, wipe it down with alcohol and then refill with new nesting material, forming a small bowl in the back of the nest. The alcohol evaporates very quickly and the fumes are usually gone before you've finished replacing the nest material. Then, replace the young in the bowl. The alcohol is said to remove not only the mites in the nest, but also any eggs that they may have laid, but I've found that the procedure needs repeating in 10 days. Two. Apply 5% Sevin dust. Because this can get very controversial, I will not tell anyone to use a chemical on their birds. However, if you want to know, "this is what I do". I use a quarter to half teaspoon of 5% Sevin dust powder and sprinkle it just inside the entrance hole on the nesting material. Then, I gently tap the nesting material to settle the Sevin down into it. The mites travel through this going in and out of the gourd and of course, get it on themselves. This will usually eliminate them within 24 hours and usually only one application is required per nesting season. Sevin dust is a pesticide so please, let's not overdo it. A little will do just as good as a lot. Again, this is what "I Do" because I have too many nests to do nest changes. Three. DO NOT use any kind of off the shelf pesticides in spray cans. These are not controllable and when used, infiltrate the entire cavity and can be lethal to young martins. None of these spray pesticides should be used in the treatment of mites, or any other insect pest for that matter, inside "ANY" wild birds nest..
My neighbor down the road has had martins for years and said that I don't need to be going through all this. Is he right? Technically, yes he is correct. But one of the worst things about any hobby is overcoming the 'old time' and 'outdated' standards that are already present in a hobby. Many refuse to change their ways to modern methods and they may not realize it, but they are missing so much out of their hobby. It's often thinking like that, that holds back progress in any subject. I like to think of myself as a free thinker and look at things from different points of view. I believe it's how progress is made in today's world. The Purple Martin is a beautiful 'Native' swallow that has in time, become totally dependent on humans for their housing. Therefore; it's up to us humans to fully educate ourselves and understand them as much as possible. That's why there are so many organizations, groups and individuals that have dedicated themselves to studying this bird species and doing testing that has enhanced the hobby of keeping them. Some of my young have fledged and now it seems as though there's all kinds of fighting. What's going on? In just about all colonies, there are extra males that were not able to pair up with a female. 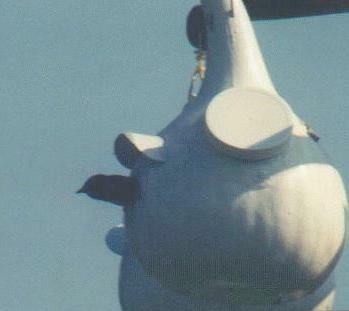 These birds, known as 'floaters", often harass the young fledglings and try to drive them away from the colony. The main reason is that they don't want the young to return next spring and become competition for nesting. This is a very common occurrence around a martin colony and is part of their everyday life, so just enjoy all the noise and commotion since there isn't anything that can be done about it. How can I insure that my fledglings are cared for once they leave the nest? You can't. Some things just simply have to be left up to the parent birds. We are only able to see to it that they make it through nesting and then fledge. From that point on, they are being taught to be wild and self sufficient birds by the adult birds. My birds have all fledged and are now gone. Where did they go? Nesting and fledging time is the most dangerous time in a martins' life. They have to nest and raise young to continue the species just like any other wildlife species and have become used to using our housing to do so. While they are in the houses, sitting on eggs and feeding and raising young, they are at the mercy of many predators and pests. There are innumerable ground and flying predators and pests that attempt to get at them at this time, so when the young are able to fly and take care of themselves, they quickly vacate the site for the safety of trees and power lines. Remember, they are wild birds and live like this the entire rest of the year, so it's only natural that they get back to 'living' as soon as possible. A sad time for us for sure, but then isn't that why we put up the housing, to have them make more martins. Why is so much literature being written about enlarging the compartment sizes of houses? A lot of study has gone into this subject and it's now a proven fact that martins prefer the larger cavities, say 6" x 6" x 12". A long time ago, some aluminum house manufacturers decided that the size of a martins' nest should be 6" x 6" square. How they derived at this number isn't exactly known because the parent birds are around 8" long, but it probably had something to do with the cost of building their houses. The less material used, the more profit for them. That just isn't enough room for two adults to raise a brood of babies. Modern testing has now proven that martins, if given the choice, will quickly take the larger, deeper cavities over the smaller ones. This allows them to get back out of the way of predators, something they can't do with the smaller cavities. In fact, this is one of the major reasons people that have these type of houses can't get martins to stay. However, if the compartments are enlarged, they often move right in. Now that the young have fledged, will the parents lay eggs again and raise a second brood of babies? No, martins usually raise only one brood of young per year. However, should a pair lose their first clutch of eggs for some reason, some times they will lay a second clutch if it's early enough in the year, but this is only under unusual circumstances. We had a total of 10 young fledge. How many can we expect to return next year? According to studies done by banding young, only about 1 in 5 or 6 young will return to the same site. The main reason for this is that nature has intended the young to disperse to other sites to prevent inbreeding. Returning young from the previous year will settle as far away as 50 miles or even further to find a new home. But don't feel too bad about this. Your birds may be populating other purple martin sites, but birds from other sites are coming to yours, thus, all sites benefit and grow. We want to add new housing. Is this going to bother the martins when they return? What about adding new housing to an active site? Is that a problem? Absolutely not and in fact, if you already have martins, then they will be the first birds to investigate the new nesting possibilities. If you put it up while they are watching, they'll probably just sit quietly by and watch the entire project. Then, a moment or two after you've walked away, they'll start investigating. It doesn't hurt at all to add new housing to a site and in fact, it's actually better. It enhances the options the birds see for nesting cavities and the more they see, the better chances of either attracting them or enlarging an existing colony. If you want to enlarge by adding new housing, then go for it. Adding housing can be done at 'any' time of year, even during nesting time. By all means, put it up. It might be just what they're looking for and could be the deciding factor in their decision to stay or not. We want to move our martin housing to the other side of our house. Will this be a problem? Maybe, maybe not. Martins, as well as all other birds, have very good homing instincts and as far as they are concerned, that exact spot is their home. If you move it very far, then they may abandon it. I know because I tried to do this many years ago when I moved my T-14 and the martins didn't come back the following year. In fact, they would fly to the exact same spot and just hover where the house used to be. They never even looked at the house in its' new location until the following year. However; if you move it only a little way, say 50 to 100 feet, then there is a good chance they will except the change, especially if it's to a spot that's more out in the open. They will see this as a change for the better and may readily accept the change. But don't be surprised to still see them flying to the old 'spot' to look for their house until they get used to the new location. But, can the housing be moved and still keep our colony? Yes, but there is a method that should be followed. It should to be done in steps and will take a couple of years. And, the distance can only be a short one for it to work. First, you'll need to get another house and put it up in the new spot where you want the housing to be located. Second, when the birds return, open all of the new house to them, but only half of the old house. When they fill all the available cavities in the old house, they'll begin looking for more room and will actually look and settle in the new house. (This is assuming that the new location is to their liking and they will settle in it). Now you have birds in both houses and they consider this to be 'one' site. Third, once incubation has started, plug any compartments in the old house that are not being used. Now, let the birds fledge the young from the old house. Fourth, once the birds have gone for the year, remove the house from the old location. You now have your martin house in its new location. If you like, you could even put the old house up in the new location if you think you want more birds. We've got problems with Starlings/Sparrows building nests in our housing. No matter how many times we tear them out, they rebuild. What can we do? One of the major problems that landlords run into is the infestation of unwanted birds in their martin housing. Since the introduction of the European Starling and the English House Sparrow into the U.S., martin landlords are becoming more and more plagued by these pests. Once established in your house, they will immediately build a nest in one of the compartments and then will not give it up, and no matter how many times the nest is removed, the pests simply rebuild. This is an ongoing problem and we as landlords simply have to get a mindset that we are going to eliminate them at all costs. If not, then they will prevent your martins from nesting and then you will lose heart and the pests will win, not only over your martins, but over you as well. Here are a couple of things that can be done. One, if you live in an area where you can shoot them, get yourself a good pellet rifle with a scope, site it in and then shoot them. Two, if shooting is not an option, then you will have to trap them. There are a number of traps on the market that are made just for capturing these pests. Check with the PMCA , they have a bunch of different kinds in their catalog. Once captured, DO NOT just drive them somewhere else and let them go. They will often beat you back to the house. Birds have very good homing instincts. They must be destroyed. Yes, it is taking a life, but sometimes we just have to take the bitter in order to enjoy the sweet. I find it very hard to kill anything and no matter how many times we remove the nest, they just rebuild it. Wouldn't it be alright to just let them be? As far as I'm concerned, "NO". I will not let any bird other than martins get a foothold in any of my martin housing, 'especially starlings or sparrows'. If they are a friendly native species, then I will provide housing designed for them and then encourage them to move on. This can be done by properly placing housing made for them and then plugging up the hole of the gourd or compartment they are using and usually, they quickly find the new housing and that problem is solved. However, if they are either starlings or sparrows, I will do whatever I have to, to eliminate them, period. Both of these bird species are mortal enemies of martins and will destroy eggs, kill the young and in some cases, even kill the adults. I hate to be so blunt, but I trap and shoot these birds constantly to keep them out of my area and my martin housing. I know that, in some peoples' minds, they are just a 'cute little bird', but wait until you see what those cute little birds can do to a martin nest and young. You'll quickly change your mind. In fact, if you think they aren't much of a threat, wait until you find a starling nest that has been built right on top of hatched young martins that have been pecked to death. If you want more details I have an entire page devoted to this problem. Martin Pests. What is meant by the term "Anthropomorphism"? This is a term used to describe 'the ascribing of human characteristics to non human things'. In this case, we tend to attach our emotional feelings to wild birds, forgetting that these are wild creatures and do not have human emotions as we might think. They instead live primarily by instincts. This is a study that can get very in-depth and I don't want to get into it here, but just remember, wild creatures don't show emotions as we humans do. For some of us humans, this is very hard to understand, but it's best if we try not to get too emotional about our charges. We have martins nesting under the eaves of our porch so we bought a house for them. How do we get them to move to the house? You don't. The birds that are nesting under the eaves of your porch are not martins but are more than likely Barn Swallows, a close cousin of martins. 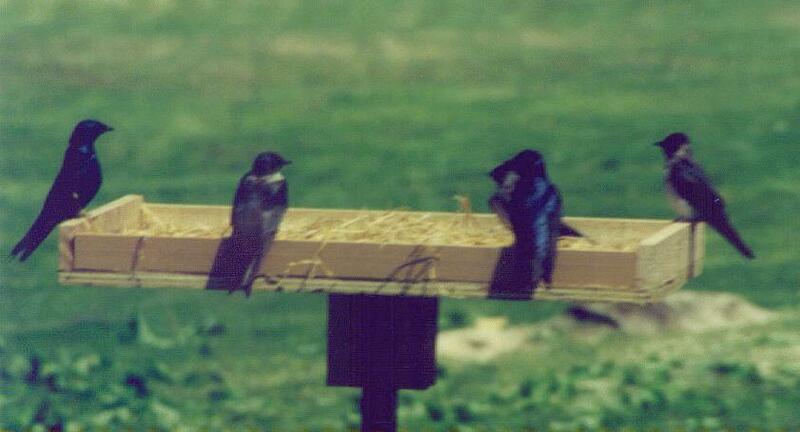 Martins are the largest member of the swallow family and nest only in man made housing east of the Rockies. Here are a few birds that are often mistaken for martins. The Barn Swallow. These birds are smaller than the martins, have a copper colored breast and sharp "V" in their tail and usually nest in open barns, sheds and even under the eaves of porches for a lucky few. 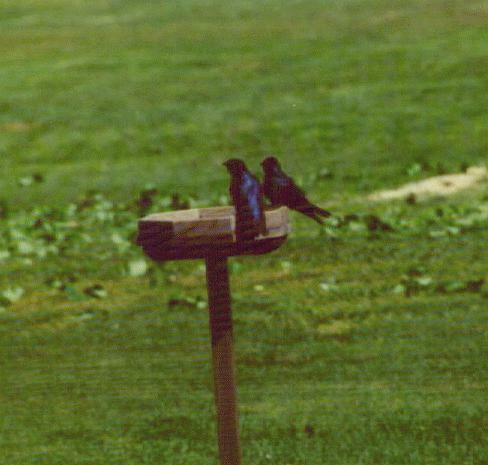 These birds will not nest in houses used for purple martins. "Barnies" usually can be seen flying very close to the ground when feeding. They may get a little feisty during brood rearing, but they are only trying to protect their young. Like martins, if you spend enough time near or around their nest, they will get used to your being around and the strafing will become minimal. (It is often considered lucky to have barn swallows nesting around your property, especially under your porch or eaves). The Tree Swallow. Another cousin about the same size of the barn swallow that will use man made housing to nest in. These birds have pure white breasts, starting just under their beaks and covering their entire bellies. They don't usually nest in close knit colonies like the martins, but one pair will take over a small martin house if allowed to. Housing such as Bluebird housing should be placed about 4 feet off the ground for them out of the way of your main martin house. The Chimney Swift. This bird species is actually a member of the hummingbird family and usually nests in open topped chimneys. (Some folks call them 'Chimney Sweeps'). These little birds are all dark gray and look like little flying cigars when on the wing. They have a very high pitched chirp when flying and feeding and will usually fly and feed in family groups. We've had swifts in our chimney ever since we bought our home in '85. Every year, we have to replace fallen young back on the ledge of our fireplace. All of these birds eat insects while on the wing and are a pleasure to have around. There are more cousins around, but these are the ones most people run across. If you have them, supply proper housing for them and then enjoy them, they are all very friendly birds and a joy to watch in the summertime. Every summer when I cut the grass, I have martins flying all around me catching insects that my mower kicks up. Should I put a house up for them? No, because more than likely they're Barn Swallows. Martins normally do not feed near the ground and instead, feed many hundreds of feet in the air. One of the reasons "Barnies" and martins get along so well is that, not only are they cousins, but they usually feed at different altitudes, thus cutting down on competition for food. When I bought my martin house, the advertising with it said things like "Control insect pests in your back yard by attracting Purple Martins" and "Purple Martins can eat 2000 mosquitoes a day". However, I've read where other statements say that martins don't eat mosquitoes and yet when they return, the mosquito population in my area seems to decline. Why is this? This has been a long time myth that was an advertising ploy used by aluminum house manufacturers to sell aluminum houses and it's still used today to attract the uneducated public to purchase their housing. The key word in the statement is CAN. However, studies have proven that they DON'T. The statement is used to dupe the uneducated public into believing that, if they put a martin house up and attract martins, all their bothersome insect troubles will go away. Not true at all. Although it is true that martins are fully capable of eating 2000 mosquitoes a day, the truth is, they simply just don't. Studies on stomach contents of martins showed that less than 2% of the martins diet contained mosquitoes. Martins prefer much larger prey. It's the same all throughout nature, the larger the prey, the more reward for the effort and energy spent catching it. A mosquito is so small that the nutritional value of one wouldn't be worth the energy spent to catch it. Now, let's stop to think for a minute. If mosquitoes hang out in heavy weeds and bushes, fly within 10 to 15 feet of the ground and martins dislike bushes and feed anywhere from 100 to 300 feet in the air, then the two don't cross paths, therefore, how would the martins eat the mosquitoes in your back yard. If you watch your martins sitting on your housing preening, you can actually see the mosquitoes pestering them just as they do us and the martins are not snapping them up for a snack. When can we expect our martins to leave for the winter? Parents and young will hang around the site for about a week or two after fledging. During this time, the parents will teach the young to feed on the wing and of course, the young learn to handle flying. Since they are wild birds, then all will revert back to living in the wild. All will move to a local communal area with other birds and congregate before the migration. This could be a power line, a small stand of trees or even a large radio antenna. Usually this area will be around a small body of fresh water. Then, one day, some small time clock rings and off they all go for points south. The birds are gone. Does anything need to be done with the housing? Now that the birds have left for the year, it's a good idea to lower the housing and thoroughly clean it out. This is a good practice because it removes any parasites that may be in the nesting material. Whether it be houses or gourds, remove the nesting materials, clean out any debris from the inside and then store in a dry out of the way place until next year. If you are using natural materials such as wooden house or gourds, this will make them last many years longer than if they were left out in the open. Storing your housing also helps to keep the pest birds out of your area since they have no place to hang out. My housing doesn't lower. How can I clean it out? If your housing doesn't lower, now is the time to correct that. Many "Old-timers" are still under the old time beliefs of just put the housing up and the birds will do the rest. It has been proven many times over that this is not the way to properly maintain a purple martin colony. Tests have proven that landlords who manage their colonies have healthier broods and much better fledging numbers than those that just let nature take its course. If possible, rework your housing so that it can be raised and lowered, either by means of a rope and pulley system or a winch and cable system. This may mean replacing the pipe or pole with one that allows the use of such a system. (Tilting systems are not acceptable. The eggs or young could be dumped out of the nest). Rework the housing so that you have access to it once it is lowered. This should be done so that the nests are not disturbed when opening the house. This will allow for nest checks and nest replacements if necessary. Rework the housing so that it has compartments larger than 6 x 6. This will make room for larger broods and allow them to back out of the way of danger should it happen by. If your housing is not of this nature, then serious consideration should be given to replacing the housing totally. Nesting time is a very dangerous time in a birds life and we should do everything we can to keep them safe. The old ways are a thing of the past. 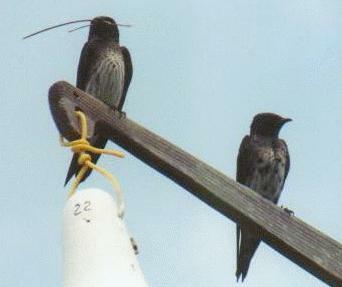 The hobby of keeping purple martins has advanced significantly and our education of the subject has also increased. The many tests that have been done in recent times have proven that a managed colony has much better results at years end and will grow with each succeeding year. It also makes the hobby much more fun. I want to change my housing. Do I take the old one down and replace it with the new one? Depends... If you didn't have any nesters in your house, then it's simply a matter of taking the old one down and putting the new one up as you said. However, if you did have nesters, then it's a little more complicated. Your site is now established and the birds are familiar with it. Any major or drastic changes in housing could cause total abandonment of a site by the established birds. The proper method to change out the housing in this case is to first, set the new housing up within 10 to 15 feet of the old housing. Then, let the birds spend a summer getting used to and moving into the new housing. If not all the compartments in the old housing are being used, then the entrance holes should be blocked off. This will help force any newcomers to the new housing. Then, after the summer is over, the old housing can be removed leaving the new housing. Now, when the birds return the following year, they will already be acclimated to the new housing and won't mind the gentle transition from 'old' to 'new'. One more thing. The following link will take you to a page that will describe the everyday happenings around a martin colony. Take a minute and read it. See if some of the things that are described there are happening at your site too.